#1 Isami Kodaka & Yuko Miyamaoto-Both official votes this week were a clean sweep. 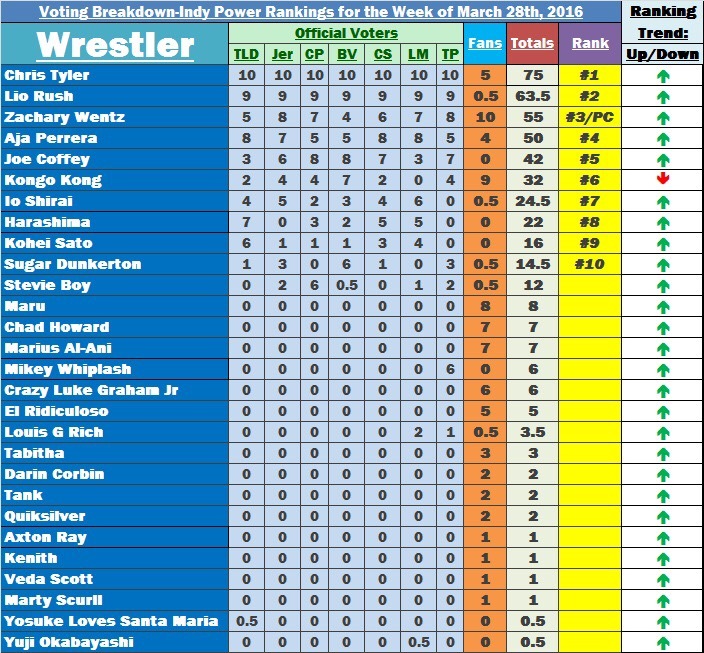 None of the official voters had any team but Isami Kodaka & Yuko Miyamoto at #1 this week. They definitely earned this #1 ranking. They teamed with Ryuji Ito at BJW on 3/24 to defeat Abdullah Kobayashi, Saburo Inematsu and “Kokutenshi” Jaki Numazawa, then teamed with Takumi Tsukamoto on 3/25 to defeat Shu Brahman, Kei Brahman & Takayuki Ueki, then teamed with Ryuji Ito and Abdullah Kobayashi on 3/26 to defeat Brahman Shu, Brahman Kei, Tsutomu Osugi and Takayuki Ueki, then teamed with Takumi Tsukamoto on 3/27 to defeat Ryuji Ito, Abdullah Kobayashi and “Kokutenshi” Jaki Numazawa to go 4-0 for the week. No matter who they teamed with, they dominated. It was an easy choice at #1 on a week that wasn’t particularly strong for tag team wrestling. #2 The 55 (Kid Fite & Sha Samuels)-The former People’s Champs find their way into the Top 5 once again as they teamed with Doug Williams & Lionheart to defeat Dickie Divers, Joe Hendry, & The GZRS (Sebastian & Tom) on 3/25 at ICW and then beat Mike Bird and Wild Boar on 3/26 to retain the ICW Tag Team Titles. A 2-0 week gets them the #2 spot. Granted, on most weeks this probably wouldn’t have quite pushed them up to a #2 spot, but you win on the weeks when you need to and you get ranked. It’s as simple as that. With this ranking, The 55 are making a serious push for one of the top spots in this year’s Tag Team Top 50. #3 Atsushi Onita, Hideki Hosaka & Shawn Guinness-The FMW World Street Fight Six Man Tag Team Champions defeated NOSAWA Rongai, Raijin Yaguchi & Tomohiko Hashimoto at FMW on 3/24 to retain the titles and then defeated Raijin Yaguchi, Tomohiko Hashimoto and Onryo on 3/27 to retain again to go 2-0 for the week. This was one of those rare weeks where we get a three-man team in the Top 5, but again, it wasn’t the most competitive week across the board. That being said, aside from our #1, there was a lot of parity among the official voters this week. In the end, this three-man team gets a well-deserved #3 ranking (and it could have been as high as a 2, really). #4 The Foundation (Ron Mathis & Jake Crist)-Their reputation and association with OI4K most likely helped with their ranking this week, but the NEW Rockstar Pro Tag Team Champions get their first ranking together this week as they defeated This Is Awkward (Sid Fabulous & Ben Kimera) on 3/23 to win the titles. This tag team has the potential to really make a great run as they have a lot of history together and as foes. If they can continue to retain these titles on a week in and week out basis, you may see them start making a big run at the Tag Team Top 50 this year. Look out for this talented team at Rockstar Pro. #5 London Riots (James Davis & Rob Lynch)-For the longest time our group had wanted to see an all-out war between The London Riots and Sumerian Death Squad (two of the coolest tag team names in wrestling). We got that war on 3/27 in a Losing Unit Must Disband TLC Match at PROGRESS. In the end, the London Riots vanquished SDS to get themselves into the Tag Team Top 5 once again. There’s no doubt that they have slowed a bit since their HUGE success in 2014 and some success in 2015, but they may now be getting back in track. If that’s the case, look out for them to make some headway in THIS year’s Tag Team Top 50. 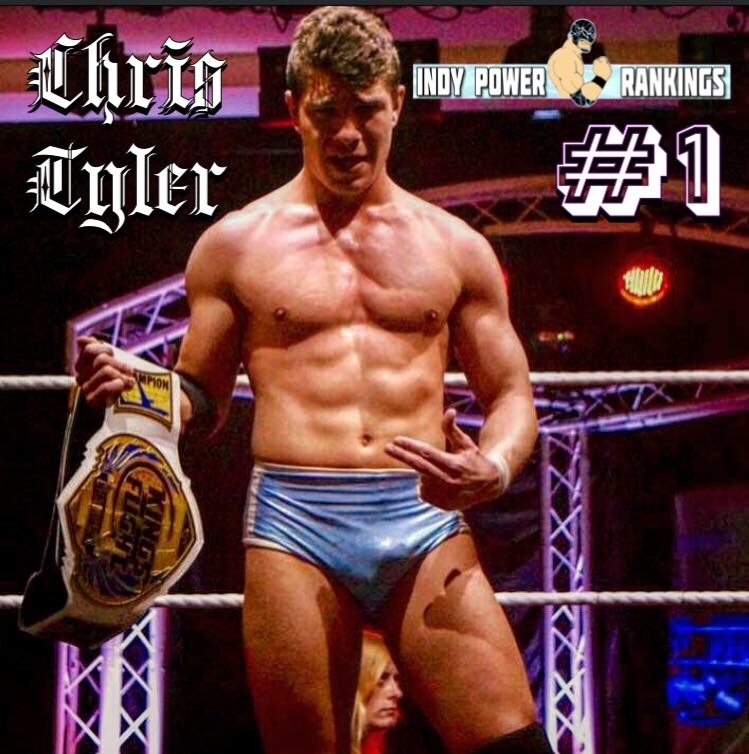 #1 Chris Tyler https://www.facebook.com/pages/Chris-Tyler/344171342301177 -And so it comes to pass that we get yet another new face in the #1 spot this year. 2016 has been a crazy year and it seems like it’s only getting more wild as the weeks go by. Tyler earned his first #1 ranking after a 4-0 week in the UK. On 3/25 he defeated White Tiger in the First Round of the Kings of Flight Tournament at HOPE, then beat Mark Andrews in the Semi-Finals, and finally beat Ryan Smile, Jigsaw, & Will Ospreay in a Four-Way Final to win the Tournament on 3/26. He added to his impressive week by beating Gene Munny, White Tiger, & Jay Garner on 3/27. It was an absolutely outstanding week for Chris Tyler who has been doing this since 2011 and now he gets a little bit of international recognition. #2 Lio Rush (@itsLioRush)-The ROH Top Prospect Winner does some good work on the indies over the weekend as he defeated Dezmond Xavier at Ignite on 3/25 and then followed that up by beating Dave Crist, David Starr, and Joey Janela in a Four-Way at CZW on 3/26 to win the title. 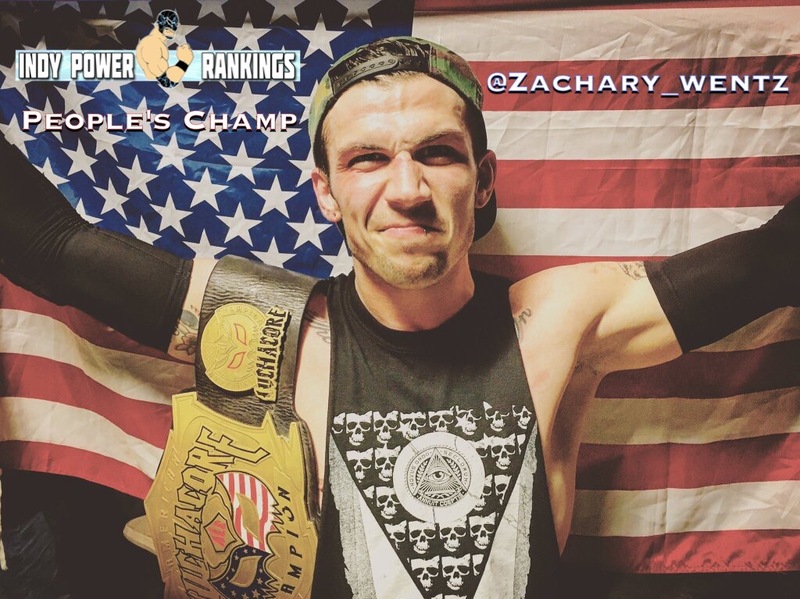 Assuming his ROH schedule picks up, we likely won’t see much of him in the Indy Power Rankings for the rest of the year, but for now he gets all the way up to a #2 ranking after two very impressive victories. Lio Rush appears to be a can’t miss prospect as he’s been tearing it up on the indies over the last two years which has certainly turned some heads in some very high places. #5 Joe Coffey (@Joe_Coffey)-Once again Joe Coffey gets ranked without the benefit of any fan votes. Coffey is a having a very good 2016 and continued that trend over the weekend as he defeated Iestyn Rees at ICW on 3/25, then defeated Lionheart on 3/26, and then then defeated Sha Samuels on 3/27 to go 3-0 for the week. One could make an argument that none of his wins were as big as some of the others in the Top 10 as they weren’t title matches or tournament victories, but keep in mind how many people won matches that were tag team matches. When you factor that in and who Coffey actually beat, you’ll see just how good his week really was in the UK. #6 Kongo Kong (@RealKongoKong)-Rare is the occasion when someone goes 2-1 and STILL gets ranked. Kongo Kong is one of those rare exceptions as he defeated Sabu at Strong Style Wrestling and then beat Sugar Dunkerton for the Strong Style Heavyweight Title in an impromptu match later in the night on 3/25. He had a great argument for #1 this week but ultimately dropped a match to Tatanka at Heroes & Legends on 3/26 which cost him the top spot this week. That being said, his title collection is starting to get massive as he is STILL dominating the indies. He’s been ranked in the Top 10 for two straight weeks now and looks to continue that success. The Monsta JUST missed out on winning this week’s online voting competition as Zachary Wentz beat him out for the top spot by just 10 votes. 141 votes gets Kong #2 in the online voting competition. #7 Io Shirai (@shirai_io)-The World of Stardom and ½ of the Goddesses of Stardom Tag Team Champions had yet another solid week as she teamed with Mayu Iwatani at Stardom on 3/21 to defeat Kairi Hojo and Meiko Satomura to retain the tag titles, then defeated Alpha Female on 3/26 to retain the Wonder of Stardom title, and then defeated Kaitlin Diemond on 3/27 to go 3-0 for the week. After JUST missing out on the 2015 IPR 100, Io Shirai is looking to make a big impact in 2016 in her quest to make sure she doesn’t miss the cut this year. #8 Harashima-Harashima gets his first ranking this week as he defeated Isami Kodaka at DDT on 3/21 to win the KO-D Openweight Title, then defeated Ken Oka on 3/26 to retain the title, then teamed with Konosuke Takeshita at DDT on 3/27 to defeat Team Dream Futures (Shigehiro Irie & Soma Takao) and then teamed with Tomomitsu Matsunaga the same day to defeat Kazusada Higuchi & Kouki Iwasaki to go 4-0 for the week. Had it not been a 50/50 week as far as singles and tag team wins, Harashima likely would have been ranked even higher, but as it stands, #8 is nothing to be ashamed of. Look out for Harashima to continue this momentum as the year rolls on. #9 Kohei Sato-This is the first ranking for Kohei Sato since August 3rd, 2015 when he earned a #7 ranking. This week he became the NEW Zero-1 World Heavyweight Champion after a 4-0 week. He teamed with Shinjiro Otani and James Raideen at Zero1 Super Firework on 3/21 to defeat Masato Tanaka, Yusaku Obata and Buffa, then teamed with Yuji Okabayashi at BJW on 3/24 to defeat Hideyoshi Kamitani and Yoshihisa Uto, then defeated Atsushi Maruyama at BJW on 3/26, and then defeated Hideki Suzuki at Zero1 on 3/27 to win the title. Impressive stuff for a first ranking this year. #10 Sugar Dunkerton (@SugarDunkerton)-“Special Dark” Sugar D gets himself into the Indy Power Rankings for this year despite an up and down weekend. His weekend started out successfully as he teamed with Billy Gunn and Shane Mercer to win a big cage match at Strong Style Wrestling on 3/25, but then lost his Strong Style Heavyweight Title to Kongo Kong in an impromptu match. Sugar Dunkerton bounced back as he won a Battle Royal at Heroes & Legends on 3/26 and then beat Zema Ion and Troy Miller to win the Heroes & Legends Cruiserweight Title to go 3-1 on the week. Last year by this time had two #1 rankings under his belt, but now that he has gotten back on track, could we see him at the #1 spot once again? We sure hope so. 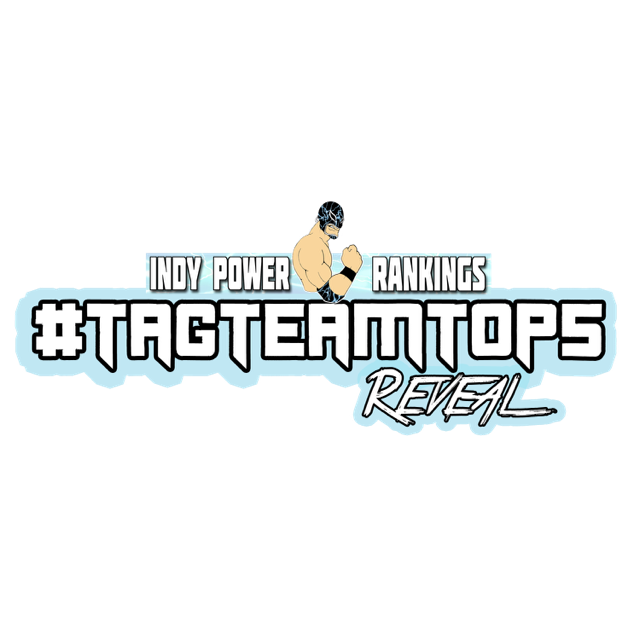 Who should be #1 in the Tag Team Top 5 for the Week of 3/28/16? Who we are and how the final vote is tallied: http://wp.me/P4kQ6t-1​Winner of the online voting competition are “People Champs” for the week AND helps their overall ranking! 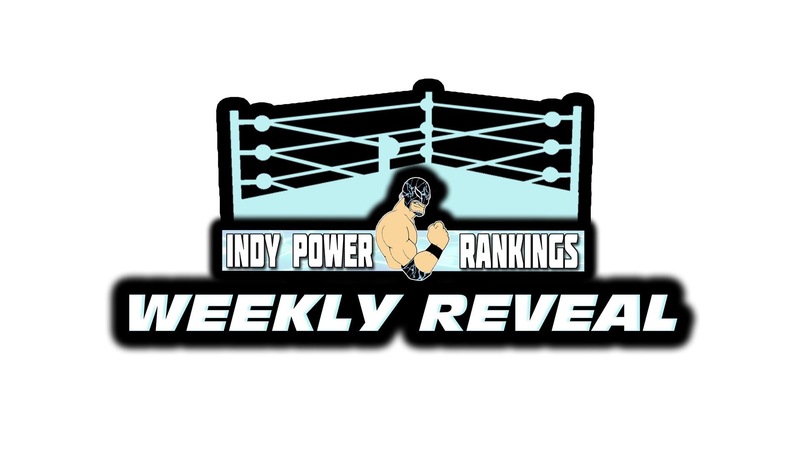 Who should be #1 in the Indy Power Rankings for the Week of 3/28/16? Who we are and how the final vote is tallied: http://wp.me/P4kQ6t-1&#x200b​Winner of the online voting competition is “People Champ” for the week AND helps their overall ranking! There is no award for second place but all votes that come in add to the wrestler’s final ranking so vote away!Winner of the online voting competition will have his/her social media, merchandise, upcoming events, etc…promoted by us for a full week! #1 Lance Lude & Timmy Lou Retton-This was an impossible week to decide. So many teams who had a shot, but it all came down to “Best Friends” and the 2016 Ivan Koloff Tag Team Tournament Winners. In the end, Lude and Retton won out. It was a narrow win for the duo, but it’s their first #1 ranking as a team, proving yet again that 2016 is all about new teams making an impact. 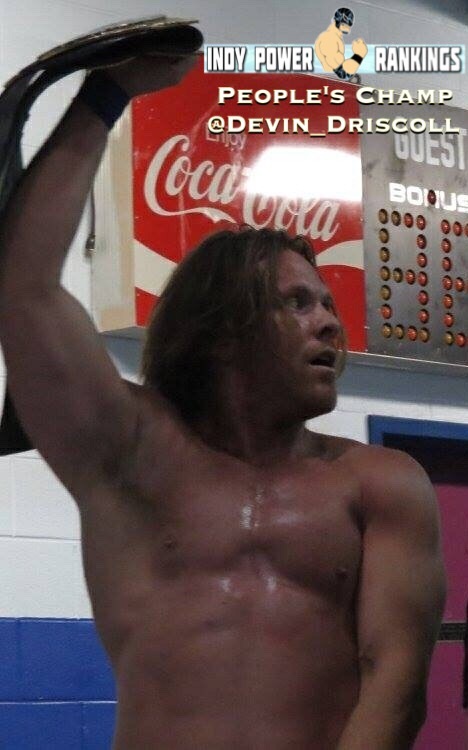 The tournament was held at NCWA where they beat The Gorilla Squad and then Joe Black & Mickey Gambino in the Finals to win the tournament with a 2-0 record. The strength of competition is slightly debatable, but to win a tournament with some kind of name value on a week where most common teams only had one win was big. Lude & TLR get their first #1…will they continue to team this year? We’ve seen a lot of one-hit wonders so far this year, but perhaps they won’t be one of them. #2 Best Friends (Arisa Nakajima & Tsukasa Fujimoto)-For the second straight week, the Daily Sports, JWP, and International Ribbon Tag Team Champions get the #2 spot in the Tag Team Top 5. Keep in mind the weight that carries in regard to the 2016 Tag Team Top 50. This second ranking shoots them right towards the top of the list as one of the top contenders for the #1 ranking this year. They defeated Kagetsu and Kaho Kobayashi at Oz Academy on 3/14, then teamed with Mayumi Ozaki and Yumi Oka the same day to defeat Koharu Hinata, Rabbit Miyu, Sareee and Yuka, and then defeated Risa Sera & Tsukushi at Ice Ribbon on 3/19 to go 3-0 for the week. Two factors likely cost them the top spot this week. 1. Lack of title defenses or QUALITY wins. 2. Lack of fan votes. The fan vote MATTERS. #3 Johnny Gargano and Drew Galloway-The EVOLVE Champions return to the Tag Team Top 5 and improve their stock in the quest for #1 in the 2016 Tag Team Top 50. On 3/20 they defeated former #1’s Team Tremendous (Bill Carr & Dan Barry) to retain the titles at EVOLVE. While they only had one win this week, their win was important as it was a quality win, an actual title defense, and let’s face it, they have the prestige of their titles and their status as independent wrestlers going for them. They even received some support for the #1 spot but it wasn’t to be. Look out for them if they can continue to defend and retain these new but valuable tag team titles. #4 Jimmyz (Jimmy Kanda & Jimmy Susumu)-The top faction in 2016 in Dragon Gate…are the Jimmyz. They get another pairing into the Tag Team Top 5 this week as this duo teamed with Kzy at Dragon Gate on 3/14 to defeat Naruki Doi, YAMATO and Naoki Tanizaki, then teamed with Ryo Jimmy Saito at Dragon Gate on 3/19 to defeat VerserK (Kotoka, Shingo Takagi & YAMATO) and then teamed with Ryo Jimmy Saito on 3/20 to defeat VerserK (Shingo Takagi, Naruki Doi and Cyber Kong) to go 3-0 for the week. They racked up 3 wins vs. quality opposition, but much like Best Friends, they really need to have some gold involved to really raise the stakes of their wins and help to raise their ranking. 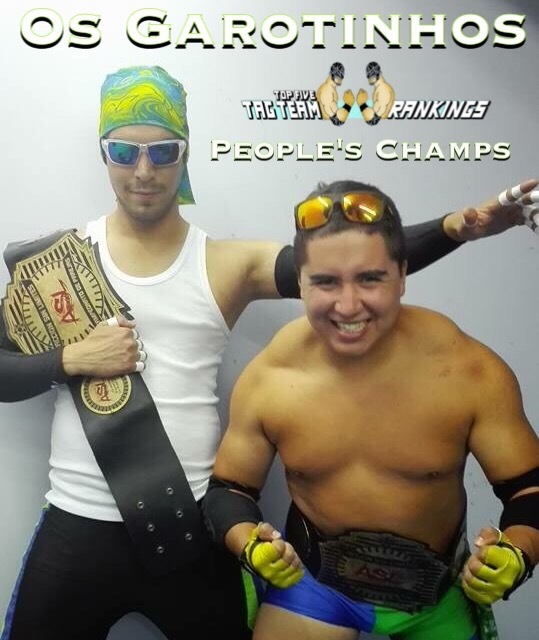 #5 To Infinity and Beyond (Cheech & Colin Delaney)-The former #1’s are AIW Tag Team Champions once again after defeating Hot Sauce Entertainment (Tracy Williams & Tyson Dux) on 3/18 to win the titles. This team has been relevant for many months and now they push their way into the Tag Team Top 5 once again. 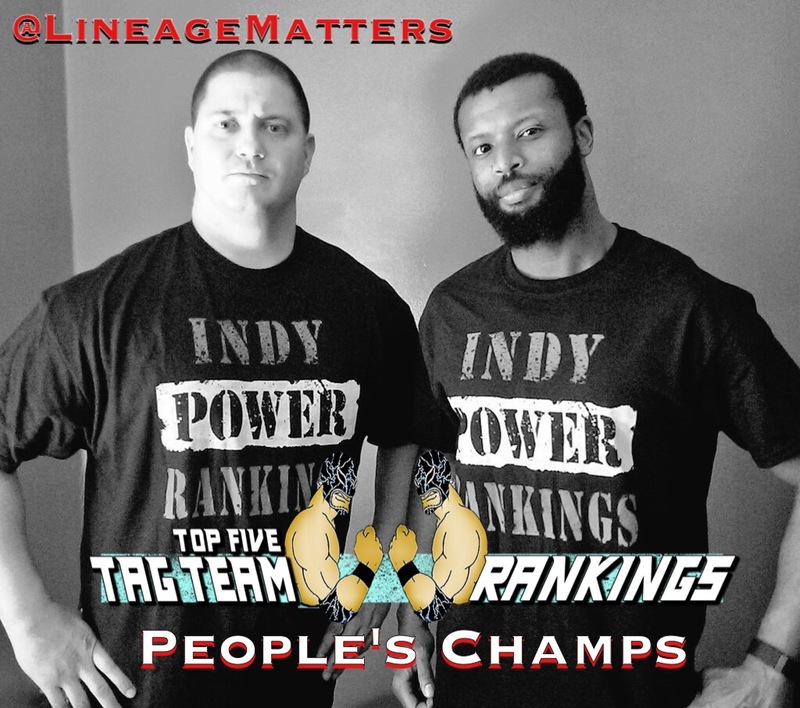 Their win was impressive as they became two-time AIW Tag Team Champions with the victory, but for our purposes, it’s also important to remember that they now hold two sets of tag titles (the others being the UPW Tag Team Titles). Look out for them to continue to make an impact as 2016 rolls on. #3 TJ Perkins (@MaskaraManik)-As crazy as this sounds…this is the first EVER ranking for TJ Perkins. 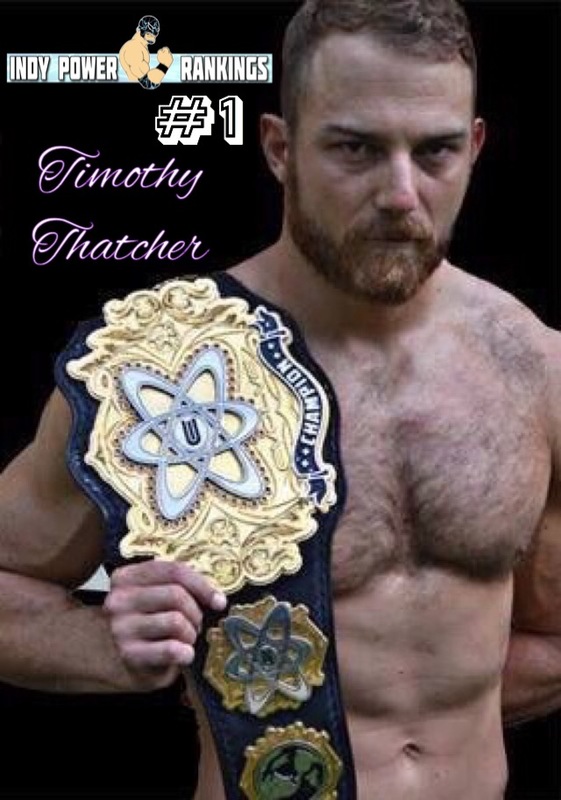 His time with TNA, etc… has limited his chances at getting a crack at the Top 10 in the past. This week was special for the veteran as he managed to top two of the best in the world when he beat Sami Callihan at EVOLVE on 3/19 and then defeated Tommaso Ciampa at EVOLVE on 3/20. A perfect 2-0 week at EVOLVE against two former #1’s in unquestionably worthy of a Top 3 ranking. Can he build on this and possibly get into this year’s IPR 100? He may have some work to do, but he’s definitely more than capable of making it happen. #4 Ethan Page (@OfficialEGO)-“All Ego” came soooo close to making this his first-ever #1 ranking, but he just fell short as he took a loss at Tier-1 that ultimately cost him the top spot this week. With that being said, #4 is nothing to be ashamed of, especially on an insane week of action like this. The AIW Absolute Champion started off the week by beating Zack Sabre Jr. at AIW on 3/18 to retain the title, then he beat Jack Gallow at EVOLVE on 3/19, but lost to VSK at Tier-1 on 3/20, and then bounced back by defeating Fred Yehi at EVOLVE the same day. So it wasn’t a perfect week for Page, but a 3-1 week does get the #4 spot. On top of the great record, keep in mind he knocked off the back-to-back #1, Zack Sabre Jr. Look out for “All Ego” to continue this great run. #5 Kongo Kong (@RealKongoKong)-The Monsta who many official voters call “the baddest man on the planet” returns to the Top 10 this week for the first time since the Week of December 28th, 2015 (a week that technically counts towards the 2016 IPR 100). He ran through a Moose and a Rhino over the weekend as he knocked off ROH star, Moose at AAW on 3/18 and then followed that up with a win vs. former ECW World Champion, Rhino at Crossfire in Canada on 3/20. A 2-0 week is good, but when you look at who he beat, you’ll see why he managed to get his highest ranking this year. The big man is still IWA World Champion and now that IWA is back, you’ll likely see him more frequently on his quest for a third straight year in the Top 10 of the IPR 100. #8 Tsukasa Fujimoto-1/2 of the International Ribbon, JWP and Daily Sports Tag Team Champions gets his first ranking since the Week of December 28th, 2015. She teamed with Arisa Nakajima at Oz Academy on 3/14 to defeat Kagetsu and Kaho Kobayashi, then teamed with Arisa Nakajima, Mayumi Ozaki & Yumi Oka the same night to defeat Koharu Hinata, Rabbit Miyu, Sareee and Yuka, then teamed with Arisa Nakajima at Ice Ribbon on 3/19 to defeat Risa Sera and Tsukushi, then teamed with Risa Sera at Ice Ribbon on 3/20 to defeat Hamuko Hoshi and Mochi Miyagi, and then won a battle royal the same night to go 5-0 for the week. If it seems like a 5-0 record should place Fujimoto higher, keep in mind that 4 of the wins were tags, so a lot of the official voters didn’t give as much weight to those wins. That being said, Tsukasa Fujimoto is having one of the best years of any female in 2016. #9 Zack Sabre Jr. (@zacksabrejr)-The back-to-back #1 finally falls, but surprisingly, he doesn’t fall out of the Top 10 completely on this busy week. The PWG World Champion and Revolution Pro British Heavyweight Champion started off the week slow when he lost to Ethan Page on 3/18, but quickly bounced back, defeating Johnny Gargano at EVOLVE on 3/19 and then Drew Gulak at EVOLVE on 3/20. A 2-1 week may seem less than great, but consider who he beat, and the fact that many official voters factor his year as a whole into their week by week voting. ZSJ may not be #1 this week, but he still holds the top spot in this year’s IPR 100 as of this week. #10 Sami Callihan (@TheSamiCallihan)-ZSJ’s closest competition for this year’s #1 ranking (as of today) gets into the Top 10 again after a brief hiatus. “The Callihan Death Machine” and AAW Heavyweight Champion teamed with Dave Crist at AAW on 3/18 to defeat Shane Hollister & Markus Crane. He then beat Ricochet the same day to retain the title. His EVOLVE weekend didn’t start out how he wanted after a loss to TJ Perkins on 3/19 but he rebounded with a win vs. Tracy Williams at EVOLVE on 3/20 to go 3-1 for the week. It may not have been a perfect week for Callihan, but he couldn’t be denied a ranking based on everything he did. People’s Champ. 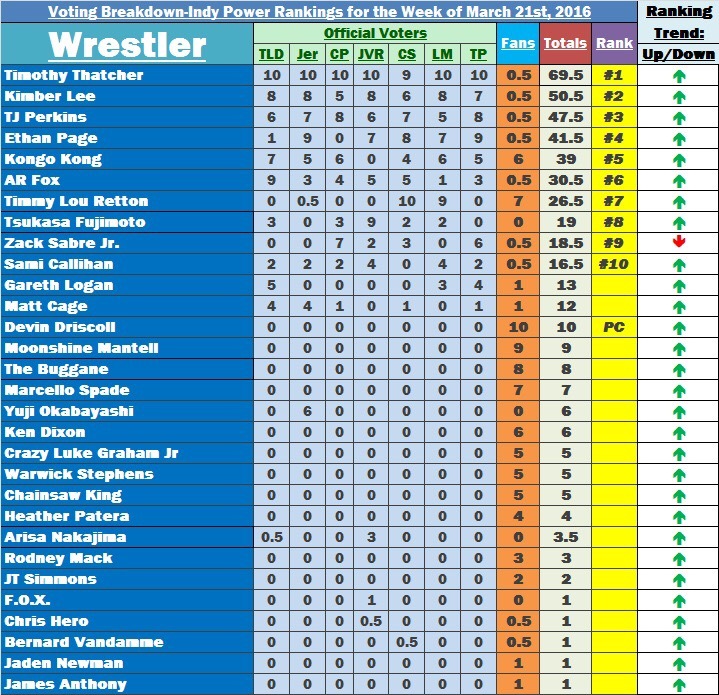 Devin Driscoll (@Devin_Driscoll)-The NEW OVW Heavyweight Champion gets his first mention in the Indy Power Rankings after defeating Ryan Howe on 3/19 to win the title. With 76 votes, he dominated all other challengers in this week’s online voting competition. He is this week’s “People’s Champ” and with this type of success, it’s entirely possible that he could pop up in the official Top 10 in the upcoming weeks/months. Who should be #1 in the Tag Team Top 5 for the Week of 3/21/16? 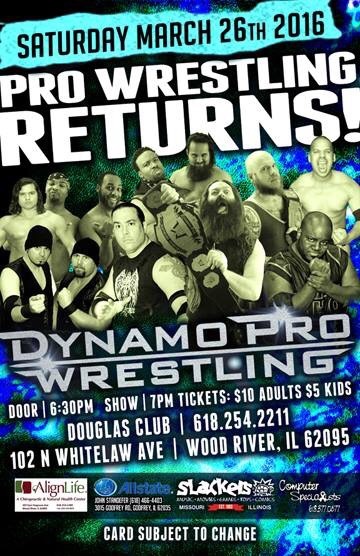 Listen to the Tag Team Top 5 Reveal as it’s yet another huge Dynamo Pro Hype Central!